Hidden among a sleepy little Meyers neighborhood is a storybook park wrapped around beautiful Lake Baron. 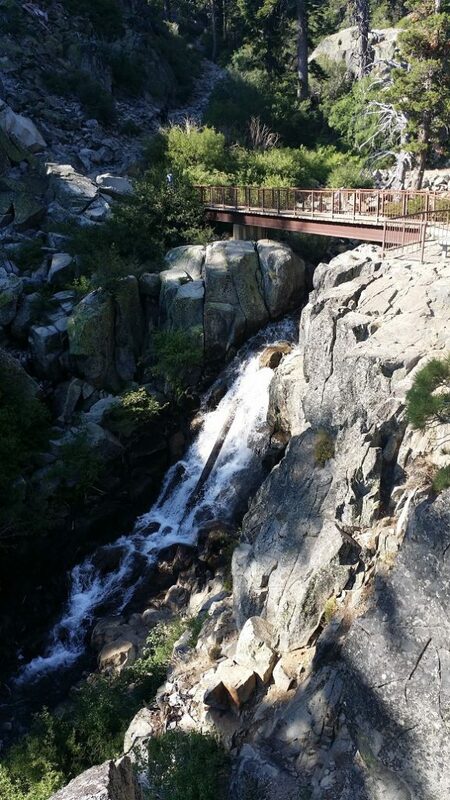 You must take a moment to enjoy Tahoe Paradise Park when you visit Lake Tahoe. 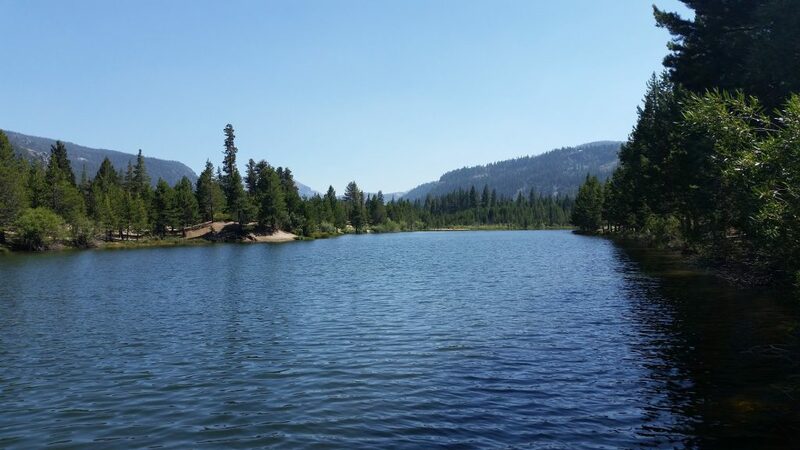 The heart of Tahoe Paradise Park is a beautiful 9-acre lake favored by locals for both fishing and swimming. 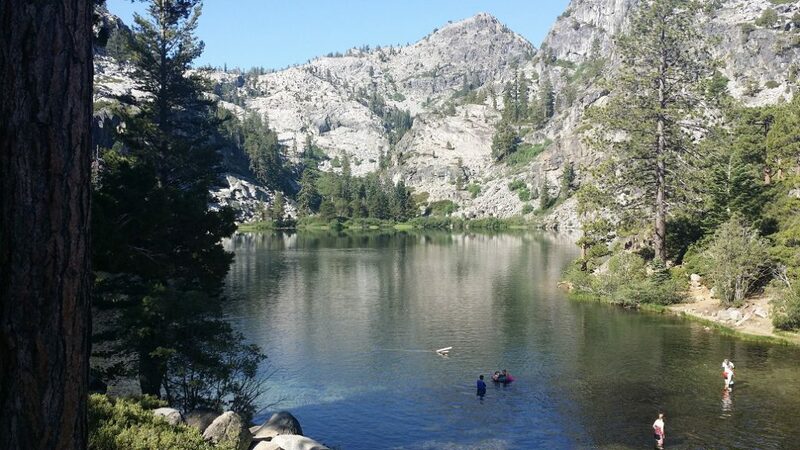 You will find few visitors as you soak in the serenity of this alpine lake. 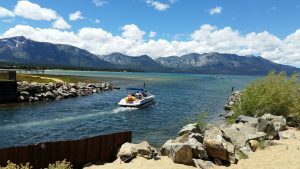 Don’t forget your canoes, kayaks and other beach toys when you visit this South Lake Tahoe Park. Lake Baron has a two fish maximum for all anglers. The children’s playground keeps even the most adventurous kids busy all day. The slides, swings, obstacle course are perfect for every age. 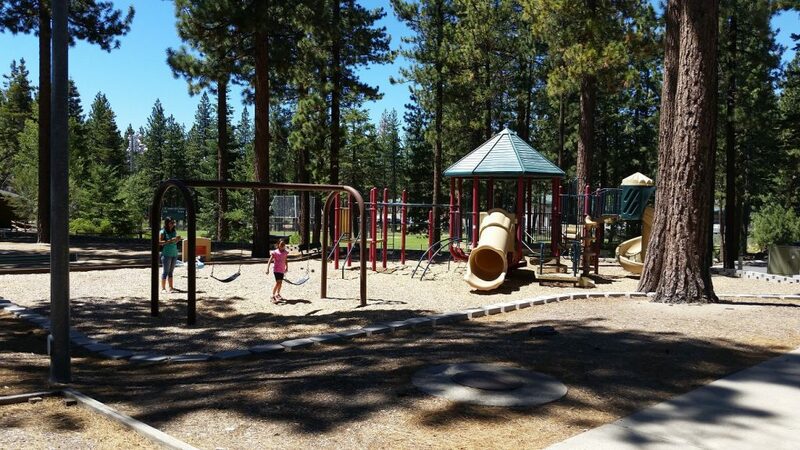 Adjacent to a large picnic area with barbecues, the playground provides an ideal location for family functions, birthday parties or just a relaxing day among friends when you visit Lake Tahoe. 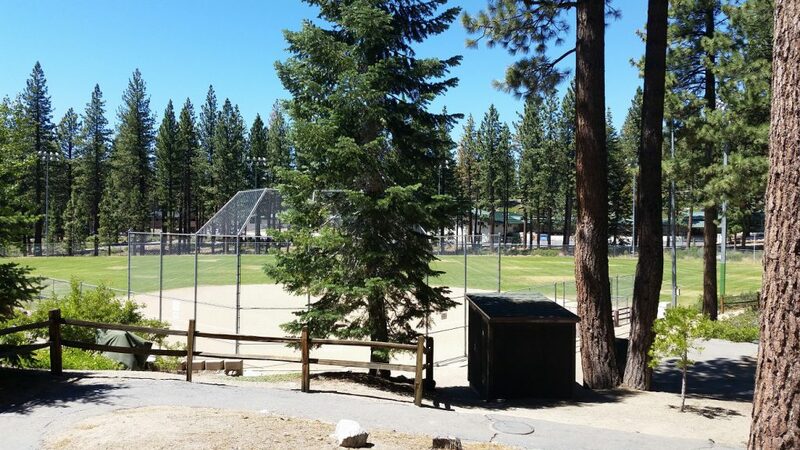 Tahoe Paradise Park is located between Lake Baron and a tributary of the Upper Truckee River. Paradise Park provides access to the river with a trail running along its banks. Leashed dogs are welcome throughout the park and on the trail. If you are looking for a charming outdoor wedding venue, look no further. 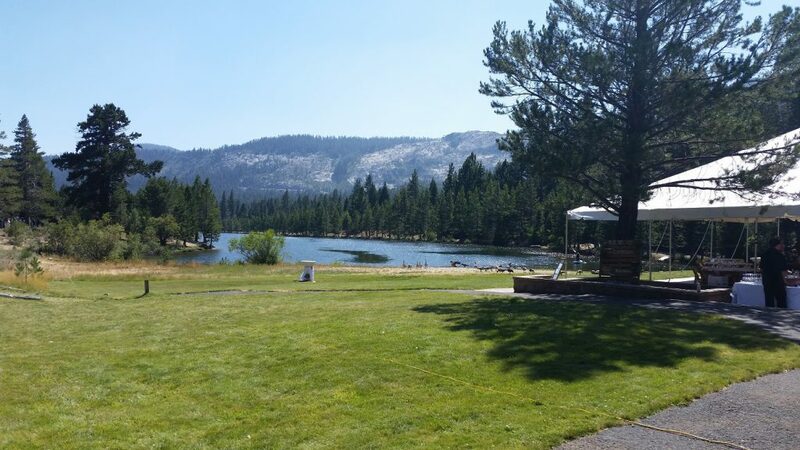 Vows are shared beneath the majesty of the Sierra Pines overlooking the serenity of Lake Baron. Paradise Park is host to both wedding ceremonies and receptions nearly every weekend during the late spring, summer and early fall. A clubhouse is available for rent with indoor restrooms and kitchen facilities. Tennis anyone? 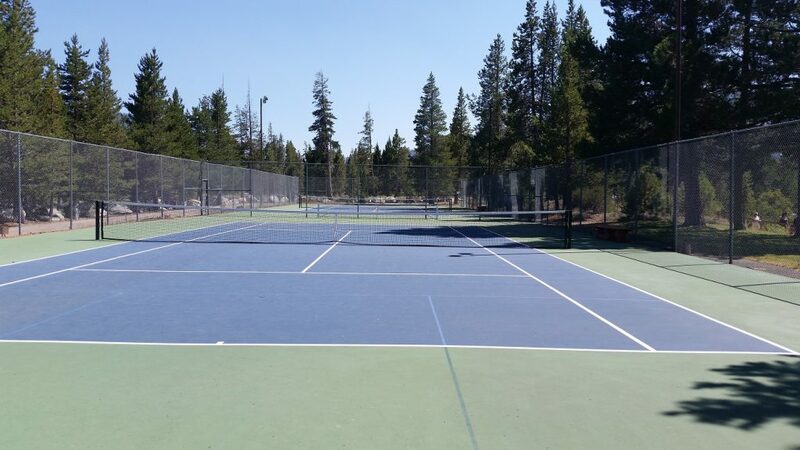 Tahoe Paradise Park has two beautiful, newly resurfaced tennis courts available for visitors. Hiking trails, tennis, kayaking, picnics and fishing, are all available at Paradise Park. Parking and admission is free! 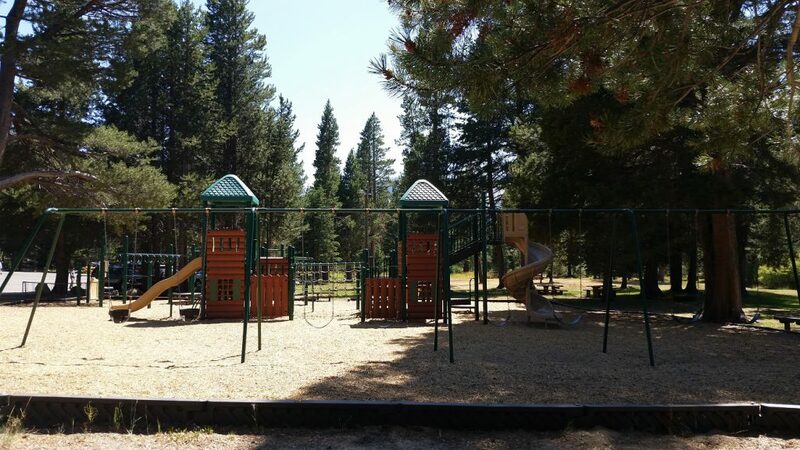 Tahoe Paradise Park is located at: 1011 E San Bernardino Ave, South Lake Tahoe, CA 96150. 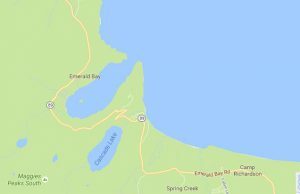 Directions – Follow Hwy 50 from South Lake Tahoe to Meyers. 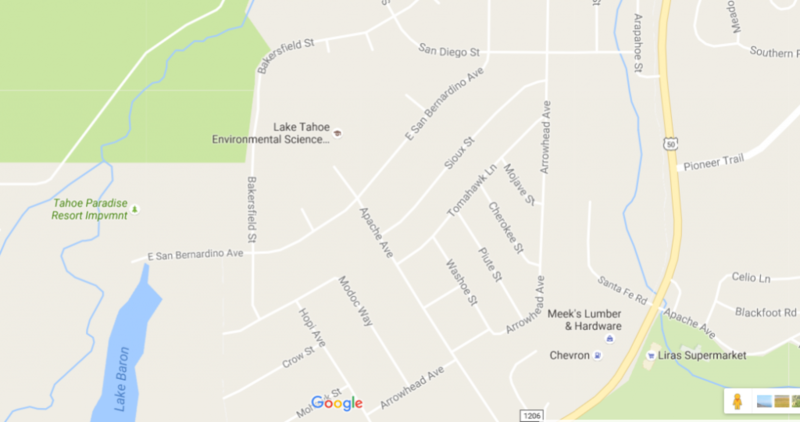 Turn right on Apache Drive just before agricultural checkpoint. Turn left when the road ends at the Lake Tahoe Environmental Science Magnet School on E. San Bernardino Ave, head to the end near Lake Baron and the Upper Truckee River. If you are looking for a fantastic and free family activity when you visit Lake Tahoe, be sure to take in the Taylor Creek Visitor Center. This is an interpretive learning center that the whole family will enjoy (including leashed pets). 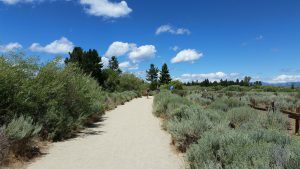 There are four flat and easy trail loops that explore the wetlands and wildlife habitats adjacent to South Lake Tahoe. 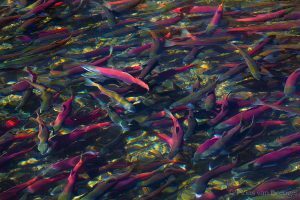 Fall highlights include the spawning run of the Kokanee Salmon and the brilliant red and gold colors of the Aspen trees. 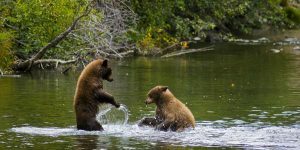 If you are fortunate (and careful) you may also see local black bears that come to feed on the salmon. 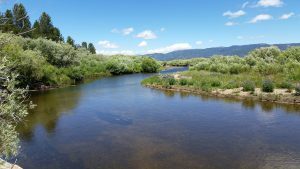 Bald Eagles, Beavers, Raccoons, Deer, Ducks and other wildlife also frequent the creek area. 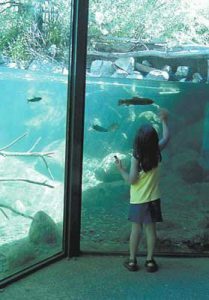 The Stream Profile Chamber (people aquarium) is an attraction which allows people to walk down into an underground chamber and view the stream habitat as it flows on the other side of glass walls, around the curved room. 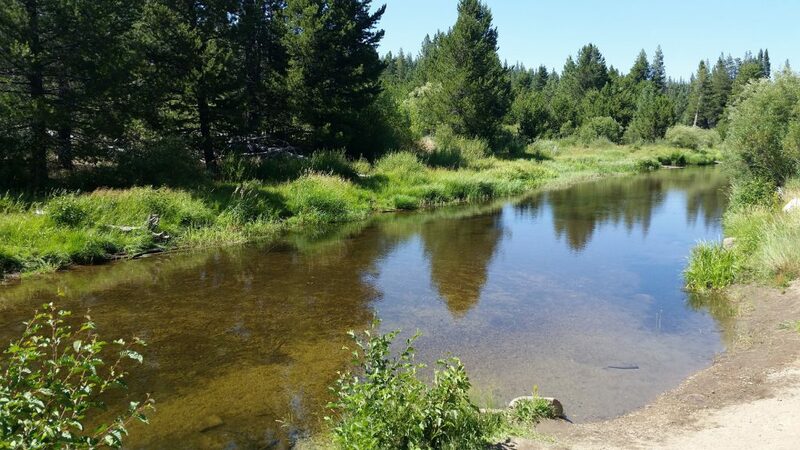 Kids can see the trout and crayfish swimming below the water and the beaver dam above. The Taylor Creek Visitor Center is open from Memorial Day through October and is closed in the winter. This is an excellent Lake Tahoe family activity. 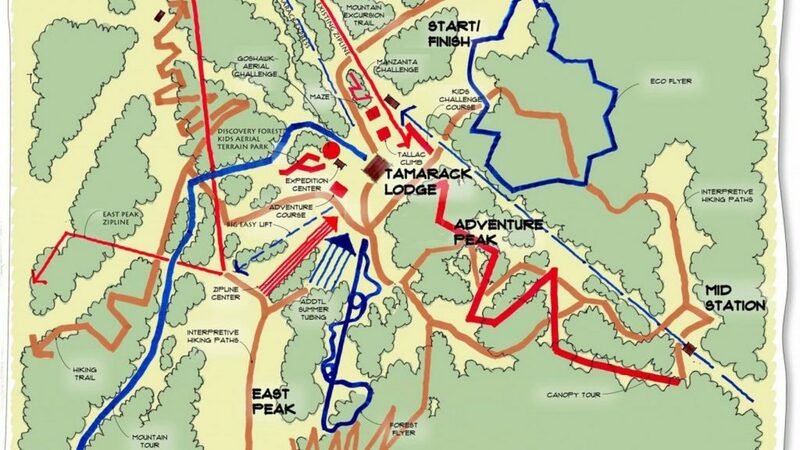 There is ample parking, restrooms and the trails are wheelchair accessible. Recently, while visiting Lake Tahoe, I turned 50 years old. My children don’t believe it and opine that I was around when the Tahoe Basin was carved out by glaciers. Anyway, I really wanted to hike the Rubicon Trail for my birthday and approached my beautiful wife with the idea. After thinking about it for half a nanosecond or so and having the enthusiasm of someone forced to spend the entire day at the DMV, she reluctantly acquiesced, deciding that I needed supervision after the Eagle Lake episode. 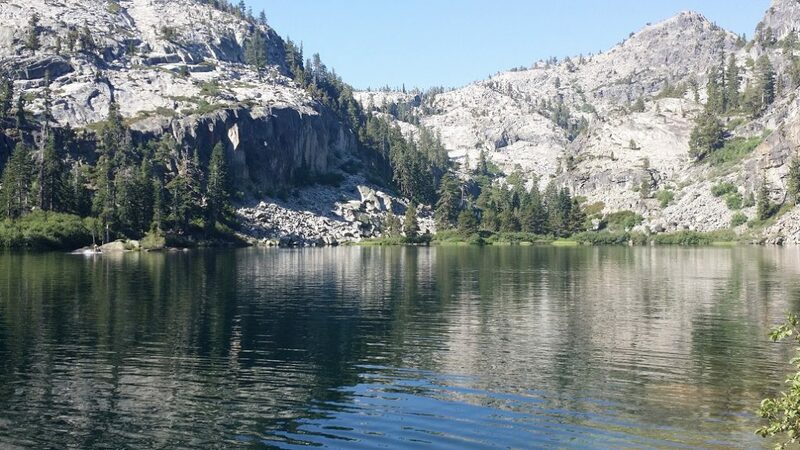 The 6.6 mile trail starts at Vikingsholm Castle at the tip of Emerald Bay and ends at DL Bliss State Park. 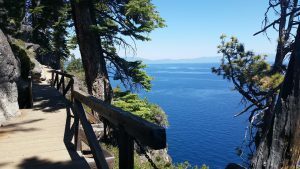 The trail runs right along the shoreline or within view of Lake Tahoe almost its entire distance. The walk took us three hours from 0840 to 1140 and according to my beautiful chaperone, was one of the most beautiful hikes she has ever been on. For comparison purposes, I have dragged her through Yosemite Valley and the Bavarian Alps and this walk was one of her favorites. It is hard to state the breathtaking beauty of this walk and pictures cannot do it justice. 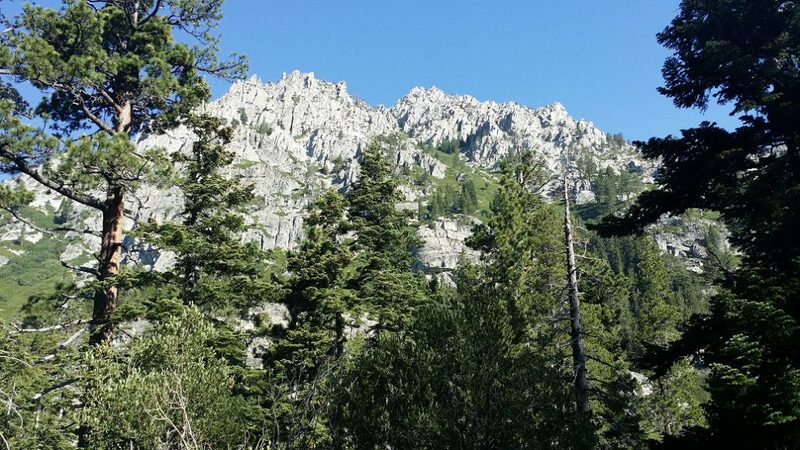 In my opinion, the Rubicon is one of the best hiking trails in Lake Tahoe. It is a moderate, mostly flat hike with some gradual grades. The steepest part of the trek is the first mile down from the parking lot to Vikingsholm Castle. I recommend leaving a car at DL Bliss State Park and then, parking a second car, starting your journey from The Vikingsholm/Eagle Falls parking lot. This way, your steepest grade is downhill. We traveled on August 15th and the weather was perfect although by the end of the hike we were very warm. We each used about a quart of water. I cannot overstate the importance of getting here as early as possible. After 9:00 AM, the parking lots are full and the highway is jammed. It cost $10.00 to park in each parking lot but it was well worth it. At the end of the journey, there were flush toilets and sinks at the DL Bliss Parking lot instead of the plastic porta-potties at the Eagle Falls parking lot. There are vault toilets at Vikingsholm Castle which is very much worth the extra time to see when you visit Lake Tahoe. The trail itself was dusty but unforgettable. Remember to stop frequently and just soak in the breathtaking views. Much of the hike is in the shade or near the water so it keeps you cool. 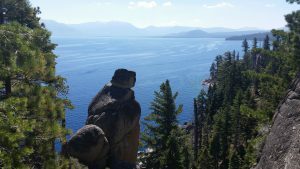 If you go, have been, or want to visit Lake Tahoe, I would love your perspective and input. Happy trails! 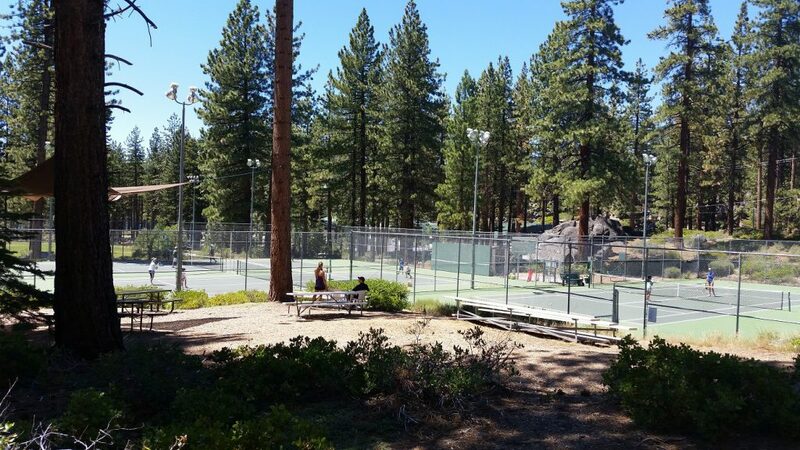 Zephyr Cove Park is a must visit if you have children, tennis players, disc golfers or hikers with you when you visit Lake Tahoe. 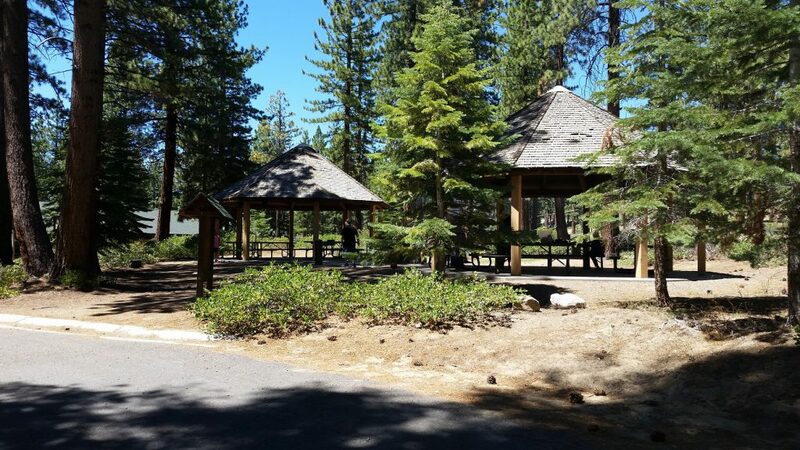 Zephyr Cove Park is the perfect place for a picnic and barbecue. There are picnic tables everywhere, by the tennis courts, by the ball field, by the volleyball court, by the disc golf course and by the playground. There are picnic areas that are more secluded, away from activities as well. 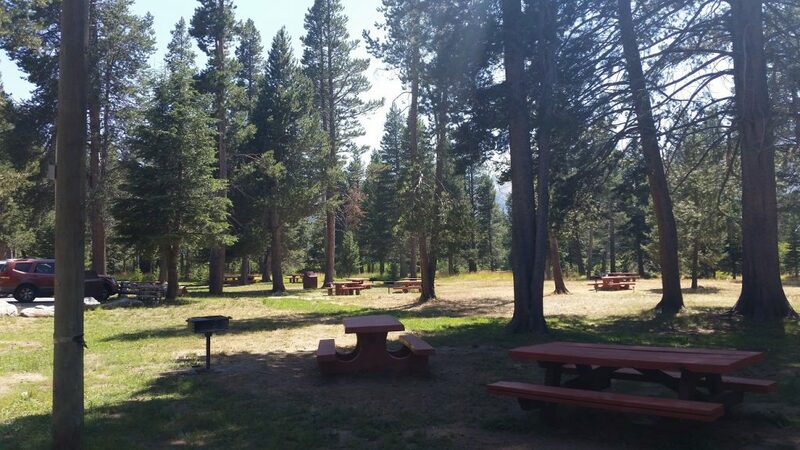 You will also find a huge group picnic area. 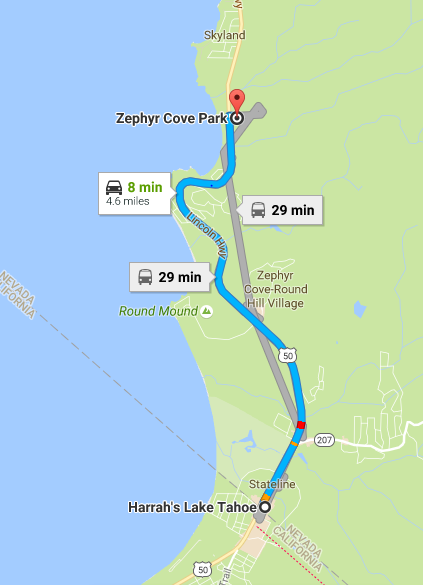 Because of its hidden location, many tourists have never heard of Zephyr Cove Park, so there is usually plenty of room for everyone. Parking is free. Hiking is free. Sledding is free. Playing is free. Everything is free, thanks to the generosity or the local residents of Douglas County. Come enjoy our hospitality! 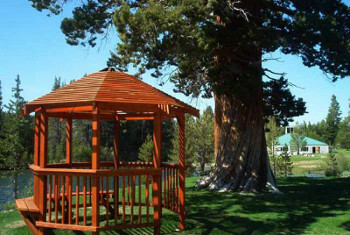 Zephyr Cove Park is located 4.6 miles from the California/Nevada state line, in Nevada. Travel north from South Lake Tahoe on highway 50 for 4.6 miles. You will see Zephyr Cove Resort and Beach on your left. Take the next right (at the fire house) onto Warrior Way. You will see an elementary school on your left and the park facilities on your right. If you turn right immediately on Warrior Way you can park in the rear by the Playground, picnic areas, and disc golf course. If you take the second right, you can park by the library, tennis courts and softball/soccer field. Today I went on a simple hike to Eagle Lake which is just above Emerald Bay. I arrived at the trail-head parking lot at 0830 and took the last parking spot available. After getting my day use permit and paying my $5.00 parking fee, I set out on my trek. For the benefit of the reader, I am 50 years old, overweight and out of shape. I wanted to see how navigable this trail was for a variety of hikers. 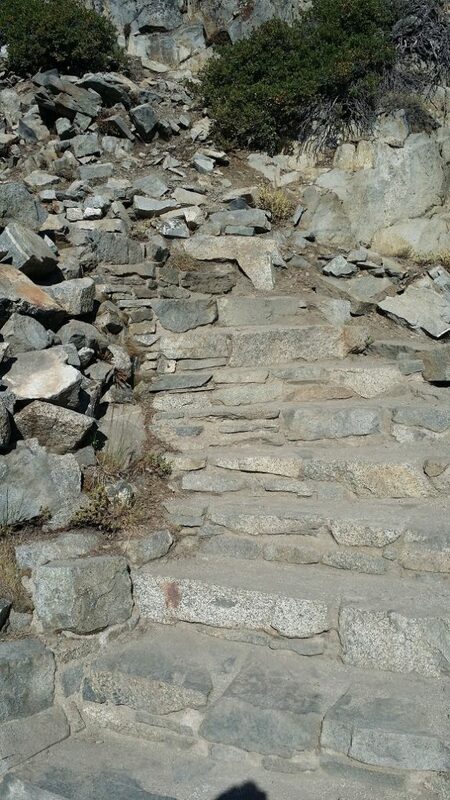 The trail to Eagle Lake from the parking lot is well maintained, well-marked and consists largely of granite stairs/steps. Upper Eagle Falls come quickly into view and a bridge crosses the falls providing views up and down a gorge. 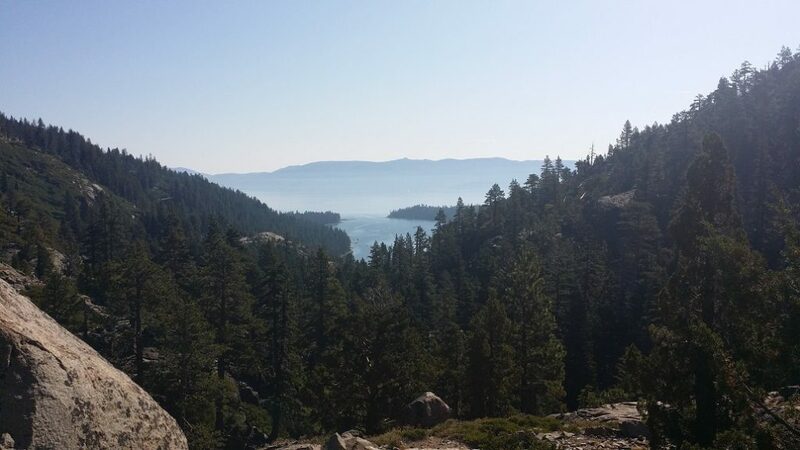 The walk was very pleasant and provided breathtaking views of Lake Tahoe and Emerald Bay. I saw several pregnant women, scores of children and the elderly all navigating the trail without issue. Upper Eagle Falls with bridge to Eagle Lake trail. One hour later, after numerous stops for pictures and sightseeing, I arrived at Eagle Lake. What a beautiful place! The craggy granite bowl and peaks that frame the lake were extraordinary. The lake is relatively small and I could see the whole circumference. This is where the simple hike began to go south. I was standing at the headwaters of the creek that left Eagle Lake and fed Eagle Falls. I hatched the idea that it would be a great idea to go see the creek coming from Velma Lake that filled Eagle Lake. After all, I could both hear and see the spot where that creek entered Eagle Lake. If I was standing at 6:00, the other creek was about 11:00. It looked like a nice stroll around the lake with the navigation of a small field of boulders on the opposite side but hey, no big deal, they didn’t look that big from where I was standing! I would go find a nice spot in the shade, listen to the brook, smoke my pipe and watch the fish jump. I briefly noted that the only people visible were all enjoying the bottom of the lake around the 6:00 position with no one visible anywhere else. Undeterred by such trivial observations, I set out in a counter clockwise direction. The day was very warm and I had neglected to wear bug spray because it was morning and I didn’t think the mosquitoes would be out yet. They weren’t – but the flies were, and in abundance. I’m not sure if the sight of an old fat guy flailing wildly at the air while climbing through the bushes was alarming or entertaining. I discovered by the time I reached the 2:00 position that nature never intended for people to traverse the perimeter of the lake. Those of you to follow would be better served by enjoying the accessible part of the lake and then going back the way you came. By the time I bushwhacked my way through nearly impenetrable foliage, I arrived and the field of small boulders which actually ranged in size from as big as my truck to as big as my house. Determined to win I forged ahead. Remember that this was a very warm day. A field of granite in the direct sun was not unlike crawling across the surface of the sun. As I dragged myself up and over rough granite trying not to plummet to the bottom, my legs became cut up and bruised. I now alternated between hanging on for dear life and hopping around on the blistering hot rocks like a spastic monkey. Add in the flailing at the flies and I must have been quite the spectacle for the rational folks. At one point I stopped to put my heart back in my chest and enjoy a bout with heat stroke. As I clung to the side of a rock by my teeth and fingernails, a passerby happened upon me. He was hanging by a rope with a harness and a bandolier of caribeaners around his chest. He yelled down to his belay person, some very unkind things about my mental capacity and decision making, which I will not repeat here. He obviously has no taste for adventure. Finally clearing the field of boulders, I bushwhacked through another impenetrable thicket of thorns, weeds, and sticks, much taller than I was, to reach the creek. Upon arriving at the creek, the brush was so dense that the water could only be glimpsed underneath the thick canopy of brush. I began looking for a way across it because thus far, except for the bleeding, I was still dry. As luck would have it, there was no way across. I fought my way to the mouth of the creek where it enters Eagle Lake and determined that the only way across was to wade across the mouth of the creek where it was shallow. Makes total sense, after all, I could see the sand mere inches below the water! I stepped out and down in the same instant. Sinking up to my knees in silt, the struggle to free myself propelled me forward. Finally able to free my legs from the silt and mud, I found myself in the middle of the creek in water up to my chest. At this point I realized three things: it was a very good thing that my briar pipe full of Captain Black Dark and my beef jerky were in the top pocket of my day pack near my shoulders. It was not a very good thing that my $800 Samsung smart phone was in the cargo pocket of my shorts two feet below the water, and third, the water really felt very nice and was an excellent complement to heat stroke! Of course there was no way out on the opposite bank so I tripped and fell and waded along the shore until I could pull myself out onto a blistering hot granite boulder. At this point a large, unidentifiable creature covered in mud and sticks pulling itself out of the lake onto a rock may have startled more than a few. (My apologies to the tourism folks). I laid on the rock catching my breath until my clothes and I started to smolder from the heat. I was at the 10:00 position on the lake. I did get to briefly enjoy an Eagle soaring overhead but when the fish started to both laugh and curse at me, I knew it was time to go. Finally making it back to the trail, I took a last look at Eagle Lake and headed back down the hill. The look of fear and concern on the faces of the tourists coming toward the lake was a bit much I think. Some averted their eyes, shielded their children or asked if I needed an ambulance. Geez, you would think they had never seen a red faced wheezing, bleeding, fat man covered in mud and sticks squishing down the trail leaving behind a trail of water before! I made it back to the parking lot at 1117 hours. When I got home, my wife took one look at me and muttered some things very similar to the guy on the rope about my mental capacity but I can’t really repeat that here. She is such a kidder! I highly recommend hiking to Eagle Lake, drinking in the majesty, splashing in the water and then going back out the way you came. I am putting together another hike soon so if you need a tour guide, just drop me a note! Happy trails! 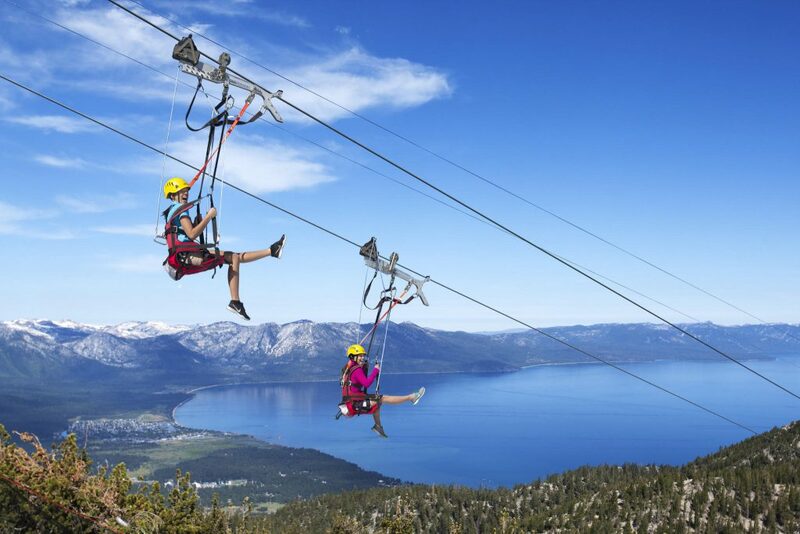 Spend the day at Lake Tahoe Heavenly Resort, zipping through the pine trees at 8000 feet, when you visit Lake Tahoe. The Ridge Rider Mountain Coaster is new this summer. Race down the 3400 foot track reaching 55 miles per hour in a car that replicates a toboggan. Each car has handbrakes that allow the rider to limit their speed for a truly customized ride. Also new this summer is the Skyway Canopy Tour. The Skyway Tour is a type of challenge course through the Heavenly canopy using aerial bridges and zip lines. The Skyway Canopy Tour and the Blue Streak Zip Lines must be purchased separately. Heavenly has packaged the fun into their Epic Discovery program. 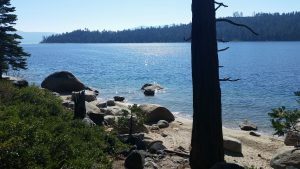 The Epic Discovery program’s goal is to “learn through play” by discovering new truths about the Lake Tahoe Basin while enjoying alpine adventures. With 12 outdoor activities, Heavenly Epic Discovery is the only adventure park of its kind in the northern Sierras. 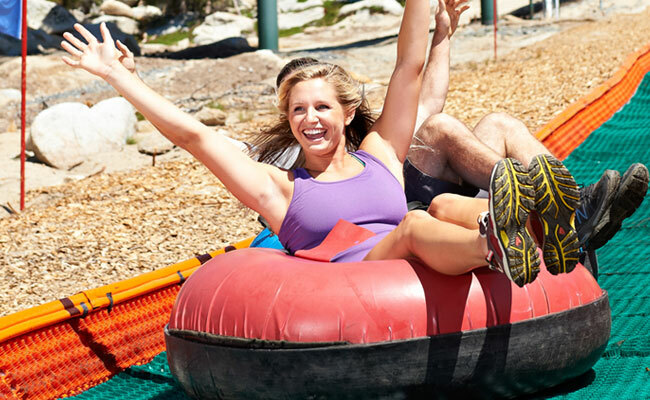 The Ultimate Adventure Pass includes all day access to the Ridge Rider Mountain Coaster, Summer Tubing, Boulder Cove Ropes Course, Black Bear Ropes Course, the Hot Shot Zip Line, Discovery Forest Ropes Course, and the Granite Peak Climbing Wall. 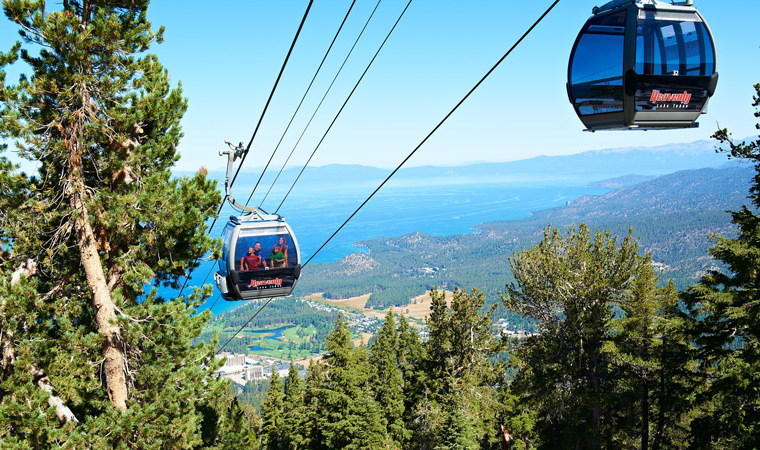 A scenic ride on the Heavenly Gondola is also included. You must be at least 8 years old and 45 inches or taller to enjoy the activities included in the Ultimate Adventure Pass. Never fear little ones, the Little Explorer Pass is just for you! If you are younger than 8 and under 100 pounds, this is the pass for you. 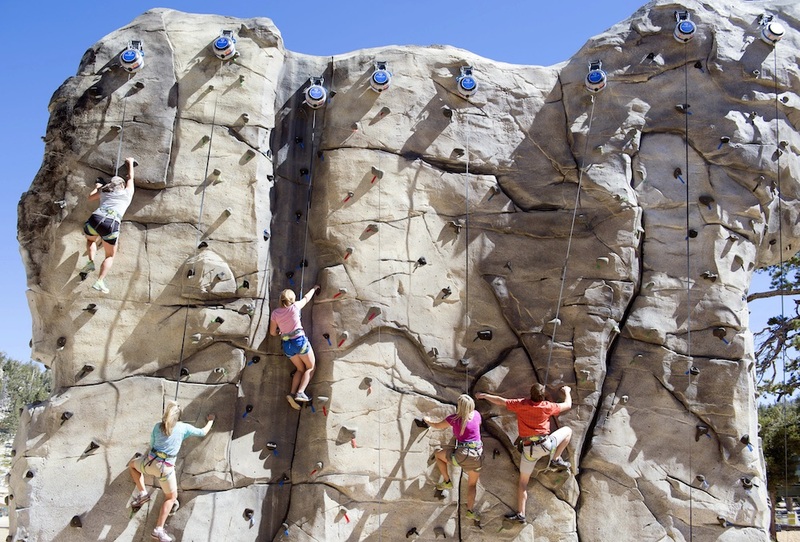 The Little Explorer Pass includes a scenic Gondola ride with unlimited all-day access to the Granite Peak Climbing Wall, Red Tail Zip Line and Bear Cub Ropes Course. 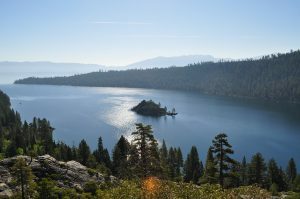 In partnership with the US Forest Service, the Sierra Nevada Nature Conservatory and the League to Save Lake Tahoe, Heavenly has provided various learning stations along the Epic Discovery path. 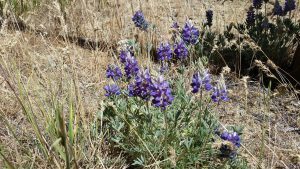 Story Stakes and Animal Abilities, feature plants and animals that thrive here in Tahoe. Pathway Stones illuminates the history of Tahoe. Epic Discovery’s learning components are a work in progress. Expect these components to come on line throughout the summer. 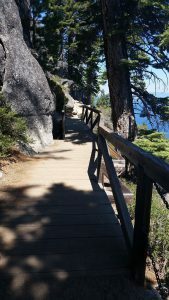 If you would rather keep your feet firmly on the ground, the Skyline Trail is one of the most beautiful trails in the Tahoe Basin. Tamarack Lodge at the top of Heavenly Mountain serves Barbecue meals, hand crafted drinks and a variety of delicious ice cream. You will also find a cell phone charging station at Tamarack Lodge. The Blue Mountain Café is located at the observation deck and offers a full coffee bar, snacks and smoothies. To enjoy the fun, visit the Heavenly Gondola ticket window to purchase your package. Epic Discovery hours are June 18th – September 5th from 9 am to 5 pm. Epic Discovery will also be open September 9th – 25th, Fridays and Saturdays only, from 9 am to 5 pm. The all-day Ultimate Adventure Pass will cost you $89. The Little Explorer Pass is just $49. If you need a room, check out Harvey’s, located one block from Heavenly Gondola. If you have already visited Heavenly Epic Discovery, please let us know what you thought. You can leave your comments above. Thanks! Cove East is a hidden cove and South Lake Tahoe beach in the Tahoe Keys neighborhood. Cove East is a California Conservancy restoration project area with habitats galore. Bring your little scientist, bird watcher, and botanist. The hiking path into the cove meanders through meadows filled with wildflowers and a 360-degree view of the surrounding mountains. 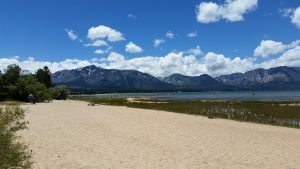 The beach is adjacent to the mouth of the marina and deep water inlet of Lake Tahoe. Because of the low water levels, the water does not meet the beach. However, there are many connected sand bars that you can picnic along and play in the water. There is ample room to spread out and enjoy time with your friends and family. The Cove East hidden South Lake Tahoe beach is found at the end of a lovely, flat, wide trail that is about 1/3 mile long. The Cove East trail is perfect for strollers, bicycles with training wheels, and even electric wheel chairs. Dogs are welcome on a leash. There is no drinking water, picnic tables, BBQ pits or bathrooms provided. So use the restroom before you head down the path, and pack in some water and treats. There are dog waste disposal stations. 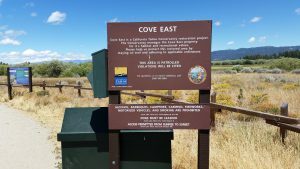 In spite of its hidden reputation, Cove East is quite easy to locate. From highway 50, take Tahoe Keys Boulevard. Take a right at Venice Boulevard. Follow Venice Boulevard to the end. At the end of the cul-de-sac you will see the Tahoe Keys Yacht Club on the left and the Cove East trail on the right. Park somewhere along Venice Boulevard. Enjoy one of our local secrets – Cove East.